The Fourth Edition of Supply Chain Logistics Managementpresents Logistics in the context of integration within a firm's Supply Chain Strategy and Operations. 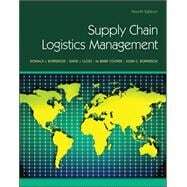 The framework of Supply Chain Management is initially presented thereby creating a foundation for in-depth study of the five logistics operational components in Part Two. Challenges and strategies related to design and operational integration of logistics within a global supply chain are discussed in Part three. Part Four focuses on administrative challenges related to cross organizational collaboration, performance measurement, and concludes with the challenges of managing risk and achieving sustainability. An essential feature of the overall presentation is the integration of topical materials and examples into the Supply Chain Logistics value creation process. Text materials are supported by study and challenge questions as well as contemporary cases. The overall presentation integrates the discussion of information technology throughout the text. Illustrations and examples highlight how firm's deal with operational challenges and use logistics performance to gain competitive advantage.